Judge Murray Silver & Rev. Martin Luther King, Sr. The Ralph Mark Gilbert Civil Rights Museum “Georgia’s first Official Civil Rights Museum,” kicks off its 2010 Capital Campaign with a Founder’s Appreciation Bash on Saturday, October 10, 2009 from 6:30 to 8:00 p.m. in the Museum’s Annex on Alice Street. The program will acknowledge and pay homage to its original Founding Charter Members. 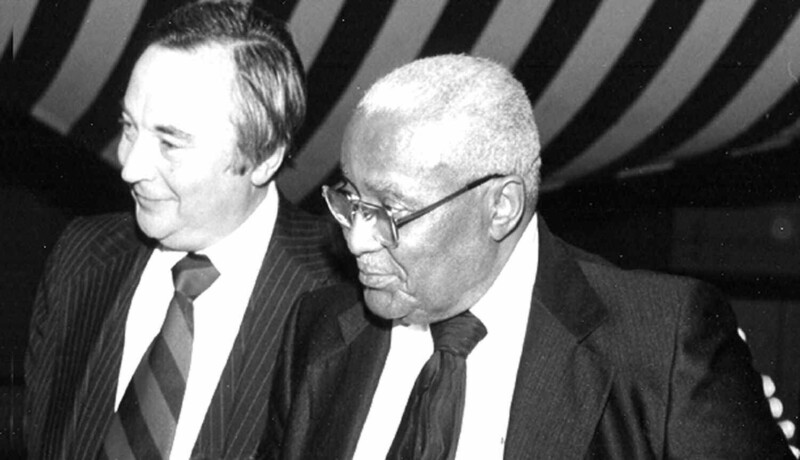 These founding members were the first to set aside funds for the museum in 1996 and 1997. The Honorable Murray Silver, Sr. a retired Judge will be the featured speaker. Judge Silver is a dynamic orator and civil rights activist of over fifty years is the author of “Daddy King and Me” a book about his long time close friendship with the Rev. Martin L. King, Sr. Guests will be encouraged to mingle throughout the beautiful new annex and enjoy food and beverages served by prominent local restaurants and caterers. A limited number of tickets at $30.00 per person can be purchased at the Museum during normal business hours, or from Members of the Board of Directors, or by calling 231-8900. Reserved seating for tables of eight is also available.